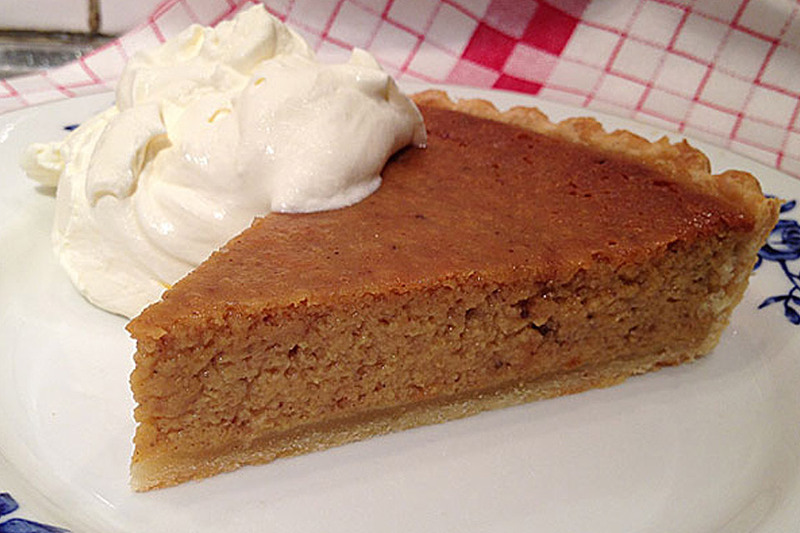 Pumpkin pie is one of the most traditional deserts Americans have for the autumn holidays. It’s not such a mystery, it’s basically a pumpkin flavored custard. 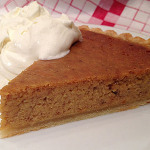 This is a reliable recipe for a great basic pie. Get the recipe for Pate Brisée pie crust. Use a straight sided 23 cm. or 9 in. quiche pan that is 3.5 cm. or 1 1/2 in. deep. For the pie crust use this recipe for Pate Brisée This will give you more than enough for a 23cm or 12in quiche pan. Blind bake the shell for 15 minutes, it should just begin to take on a little color. Mix the pumpkin with all the spices, eggs and sugar and mix well. Do not whisk too much because you don't want to incorporate too much air. Finish the filling by mixing in well the condensed milk. Fill the uncooked pie crust. There should be enough filling to come right up to top of the shell. Remove and let cool on a rack for about 1 to 2 hours. If you can only find sweetened condensed milk which sometimes happens here, simply cut the sugar by half. The measurements for the pumpkin and condensed milk are for how it comes here in Sweden. A small can of pumpkin (Libby's) is 425 grams and a small can of condensed milk is 290 grams. But I have given both U.S. and European measurements. Serve this at room temperature with a big spoonful of sweetened whipped cream. You will find that using canned puree will give you a much firmer custard. Its more work but making your own pumpkin puree is really worth the effort and saves you days of hunting around to find it canned. Making Pumpkin Puree: This is the first year that I couldn't find pumpkin in a can so I made my own, its very easy. You will need a 2 kilo or 4 pound sugar pumpkin. Simply cut the pumpkin into large wedges, coat your hands with a vegetable oil and just put a thin coat of oil on all the wedges and place them in one layer on a large baking sheet. Bake at 200°C or 400°F for 30 minutes. Remove from the oven and while still warm remove the rind and cut up the pumpkin into smaller more manageable cubes. Push through a strainer. (You don't need to use the tightest or finest strainer you have a normal kitchen sieve is fine.) Take the pumpkin puree and place in a clean sieve and let it drain over night on the kitchen counter with a towel over it. It's then ready to use.